We’re just a month away from the start of VueConf 2017 in Wrocław, Poland. If you use Vue.js as part of your daily development toolkit, you’re probably starting to make preparations for the trip. However, if you don’t have your ticket bought already, before you book a hotel room and find a convenient flight, there’s probably one more person you need to get on board: your boss. After all, you’ll be off for 2 days (or 3 if you join workshops) and at least some part of the expenses will be covered by your company. That’s a commitment! Let’s have a look at the steps you can take to smooth over that part of the process. Before you can convince your boss to send you to VueConf, you need to know why you want to go. Let’s recap what this event is all about. Co-organized by Monterail and Vue.js creator Evan You, VueConf is the world’s first official conference devoted entirely to the Vue.js framework. 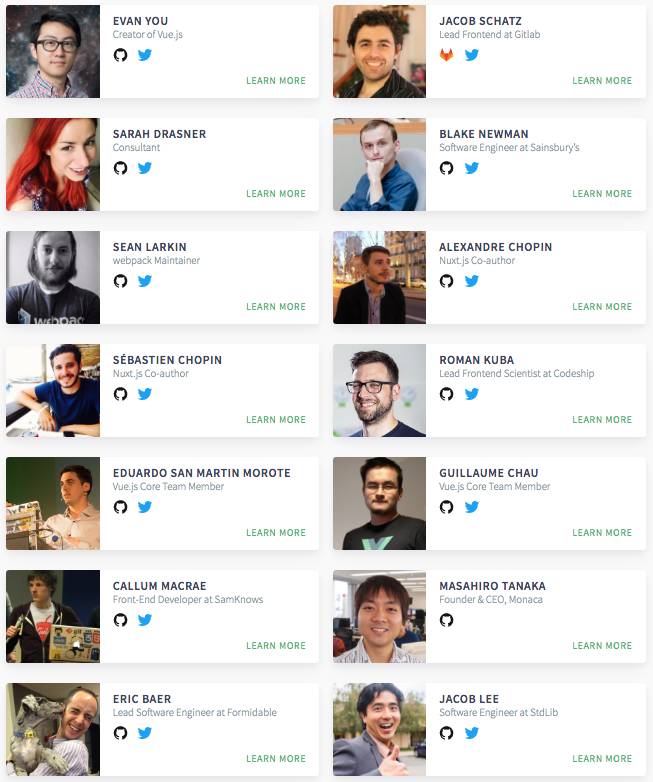 The program is designed with more seasoned developers and hobbyists in mind: if you’ve already gotten the hang of Vue, you’ll benefit from the chance to mingle with other people in the field and participate in a total of sixteen talks on topics ranging from testing and animations to hybrid apps and advanced techniques for large-scale applications. You’ll also hear case studies from real-world companies that rely on Vue. Of course, VueConf is all about the learning experience: you won’t be hassled with sales pitches or marketing talks. Along with Evan You, who’ll be giving the keynote speech, the international lineup of speakers features an entire host of Vue veterans. Additionally, Sarah Drasner will hold a workshop on animated interfaces with Vue on day one, before the official launch of the conference. Also, Blake Newman, a software engineer at Sainsbury’s, will explain how Vue.js can work as a progressive web application. There’s plenty of more featured guests. Follow VueConf on Twitter for updates on speakers, talks and more. Now that you’ve made up your mind to go, you need to break the news to your boss. Just remember one thing: if you don’t sound committed, you’re not going to be convincing. Don’t hem and haw when about it when you talk to her. Being direct and enthusiastic about what you want shows that you truly consider it to be a valuable use of your time and company resources. Try to see things from your boss’s point of view (no pun intended). Your employer probably has a set budget for conferences, training, etc., and managers have to make the best possible use of those resources. That means spending them on advantageous opportunities that are likely to bring value back to the company. Make sure to explain why it’s a good idea to invest €299 plus travel expenses in the skills and insight you’ll gain when you spend two days with the top names in the world of Vue. This is where you’ll want to mention some specifics about the conference itself. Talk about who’s going to be there: Start out by pointing out that the roster of speakers is veritable who’s who of the industry, from Vue.js creator Evan You and core team members Blake Newman, Eduardo San Martin Morote and Guillaume Chau, to Nuxt.js devs Alex & Sebastien Chopin. This is an opportunity for you to learn from — and share thoughts with — the people at the forefront of the Vue world. Don’t forget about networking: This is the first international conference devoted entirely to Vue, and you’ll meet plenty of people who may turn out to be valuable contacts. Some of them may have run into — and cleared — the very same hurdles you’ve come up against. Be sure to emphasize that you’re not just attending a series of talks: you’re becoming part of a mutually-supportive community of developers. If you’re looking for some more inspiration on how to get your boss to send you to VueConf, why not ask around the office? Find out if any of your co-workers have attended tech conferences like this one. Inquire about how they applied the skills, knowledge and networking experience to their jobs after coming home. Think about whether you’re in a position to do the same. These will be important examples to draw on when you talk to your boss. If you’ve convinced your boss to send you to VueConf, be sure to share your experience in the comments. And for everyone else: good luck and we hope to see you in Wrocław!